Essentially, we’re travelling throughout the majority of Europe and Asia on an adventure. We will stop and start as much as we like – so long as our visas and permits allow us – and go where we please. On leaving the UK, our route will take us initially north through Scandinavia, before turning south through Russia and Kazakhstan, south again along the Karakoram Highway, into and around India and then on to Bangladesh. From here, we will ship our car to Singapore, from where we will commence our return journey through South East Asia, China and Mongolia. We will then join the Silk Road in Kyrgyzstan, following this ancient highway through to the Caucasus before our home stretch via the Balkans and Western Europe. Take 1: Having always wanted to drive to India and back, Charlie initially plotted a route through northern Europe, through Kazakhstan and south through Pakistan and into India. Take 2: Then we questioned what we were going to do with the car once we’d got to India – indeed where in India would be our finish line? 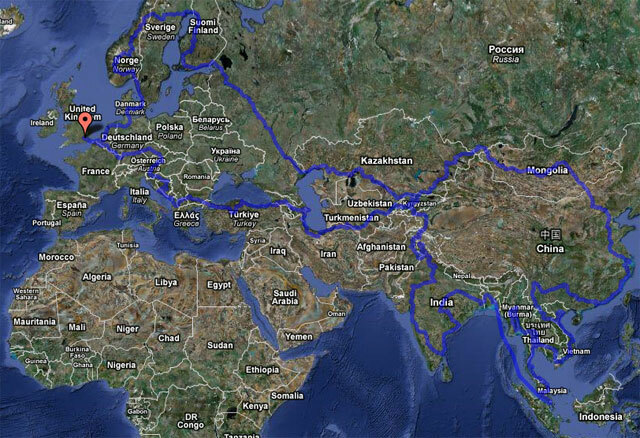 Why not drive around the whole of India? By then, we’d have been in our trusty car for the best part of 5 months; it would be a pity just to sell it on. The obvious answer was then to drive it home again by an alternative route. Take 3: We pondered for a week or so at the best action to take… Charlie then came home triumphant from work one day (obviously not that busy a day in the office! ), with a solution to our homeward bound itinerary. His answer? Cover the rest of Asia! Nina, initially finding this idea hilarious and insane in equal measure, soon came round – why bother going on a trip of a lifetime and leave out half a continent? Dramatic seasonal fluctuations and mountain pass closures then fashioned our final route, establishing the figure of eight shape. Note - whilst we are pretty confident in this ‘final’ route, anything can happen (and often does, especially in Asia) and much time will pass between boarding a ferry at Dover on June 15th and our arrival in many of these countries – it is likely our route may change significantly as we go!